Schlumbergera bridgesii, commonly know as Christmas Cactus, and its relatives are very popular houseplants. When they bloom, they produce colorful, tubular flowers. These beautiful flowers, their long bloom time and easy care requirements make them a wonderful plant. Unlike many other cacti, Christmas Cactus is not a cactus from a hot, dry climate but rather one from a tropical climate. 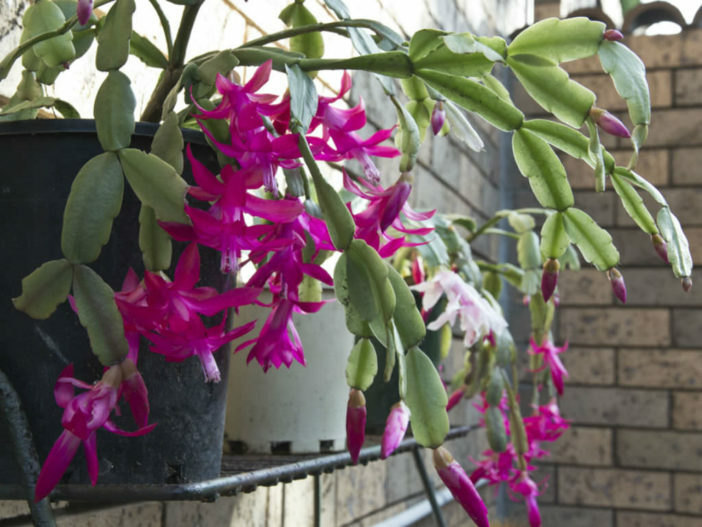 As its name implies, the Christmas cactus blooms at Christmas. Keeping it healthy and blooming properly requires an understanding of its needs, such as how often to water it. Water when the top inch of the soil is dry. Always take into consideration the climate and time of year. If your Christmas Cactus is outdoors in a hot, dry climate, you might need to water every 2 to 3 days, especially if the plant has been in the sun. If you keep the cactus indoors where it is cool or humid, it might need water only once a week. Water less during the fall and winter to help stimulate blooming. Overwatering is a problem for Christmas Cactus just as it is for other cacti. Overwatering can lead to fungal rot diseases such as white rot and can cause leaves to drop. White rot disease is easily recognized by the white spots on the leaves. If Christmas Cactus does not receive enough water, it will wilt and its flower buds will drop. Unlike a desert cactus, a Christmas Cactus cannot tolerate completely dry soil. To avoid problems with fungus, avoid overhead watering. Christmas Cactus does best in a humid environment. This is particularly important for gardeners living in a dry climate or whose homes have a dry indoor climate. The easiest way to provide humidity is to place a tray of water near your plant. The water evaporates into the atmosphere, providing the needed humidity. Another way is to put gravel in a dish and fill with water before placing the potted plant into it. Misting your cactus with a spray bottle can also provide humidity.